A childhood meeting spawned an electronic act that is continually looking to expand their music far beyond the decks and into the realm of tribal dance. There is still an air of mystery shrouding the true meaning behind the acronym M.A.N.D.Y; it’s an alias that is as intriguing as the music that its members, Philipp Jung and Patrick Bodmer, have released out into the world. With an uncanny knack for getting people onto the dance floor the German childhood friends have racked up a host of commendable releases through Renaissance, Fabric Live mixes and Mixmag collaborations and have even established their own label in Get Physical. They have spent tortuous hours remixing their huge collection of little known music. M.A.N.D.Y are as much audiophiles as they are DJs and like nothing better than locking themselves up for days in order to get the mix just right. It is something their rather large fan base has come to love about them. Ahead of their upcoming show at Chinese Laundry in Sydney, we grabbed 10 minutes with one half of the duo, Philipp Jung, to talk light shows, candy bars and girls. (Pulse) First things first - we have to ask - what’s behind the moniker M.A.N.D.Y, nothing sinister we hope? (Philipp) When we get to play in front of some dodgy people, we turn into this incredibly bitchy witch called Mandy. But on normal days it just means Me AND You… Patrick and me. We know that you and Patrick are childhood friends but how did you first meet - did he have the bigger bag of sweets? Most definitely. Patrick loves the sweets. I am more a salty guy. We met on a tennis court but we don’t remember who kicked whose arse. We played equally well, so I guess it was pretty even between us. Both of us didn’t like loosing so much, so a lot of swearing was done the time. You are credited with a knack for getting people to move and dance to your music. How do you do that? Is there a science behind it? We both went out a lot when we started raving and danced from the second we arrived at the club. And we loved to look at girls dancing all night long, the energy they spread; they infected the whole room at some point. It never gets boring. No science behind it at all. What was the ethos behind Get Physical - business move - freedom - the love of music or a mixture of all? Freedom first of all. We really wanted to create our own imprint. We knew the stuff we did was good enough to take this risk. We got turned down by nearly all distributions and labels at the time, so we thought: Now is the right time!! Lets talk about your past live shows - there were lights, infrared tech and complicated mapping things - can you explain what goes into M.A.N.D.Y live? We stopped the live shows 2 years ago as we needed to find a new approach. But actually we are preparing lots of new music and we are happy to attack the big festivals again. We are having heaps of fun in the studio and are preparing a special show right now. Its very difficult and challenging as so many people are doing these kind of shows. So we have to come up with something beautiful, which excites us both, and in the best case the public too. Sure we’ll get there. Do you think all acts are now considering the 'showman' elements of their live act and if so why? It’s the normal development. One starts and all the others have to match and do even bigger shows. It’s in the human nature. But I really do like our show still. We are just doing an upgrade as we speak and we will present it next year. We think it’s great if the music goes with some visual components. It triggers a lot of brain cells and we love to get excited about that combination of elements. In the Body Language, the Fabric mixes and the Renaissance releases you have a serious catalogue of music to pull from, how do you decide what goes on the set list? Very honestly, it’s nothing but hard work. For these comps we prepared music in a time span over 4 months. We do have a very broad record collection but you have to bring it all together. We licensed over a 100 songs for each comp and tried every possible combination to get the best result. We nearly ruined ourselves in doing some of them. We were obsessed to find the perfect record, never-ending and torturing. But we always kept the smile. What’s in the kit bag for Australia - anything special - anything a bit weird? Nowadays the different territories are not so different anymore. Due to the www everyone has access to the same music. So of course I have to dig deep and deeper to find music people haven’t heard. It’s still the main approach we think. Presenting new music that people listen to for the first time. Not every track, but a good part of it. And there is always a yes to weird. It will get a lil weird. Promise. You are due to get down and party at Chinese Laundry on Saturday. What can Sydneysiders expect from your show? If they let me, a 5 hours set with all my best jams. Nothing but great memories for that place. Very excited to be back! 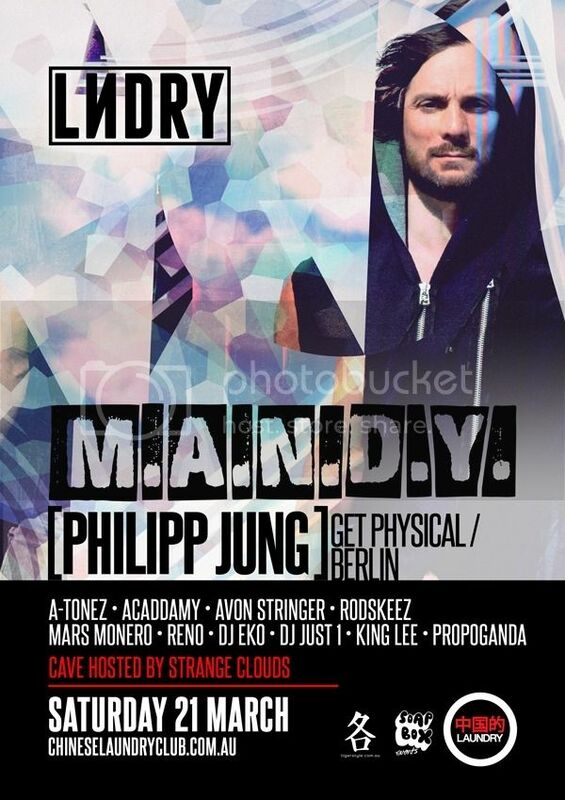 M.A.N.D.Y (Philipp Jung) headlines LNDRY this Saturday in the Cave. (21st March). 1-close in the Cave with Strange Clouds hosting that room. Visit the Chinese laundry website for more details.